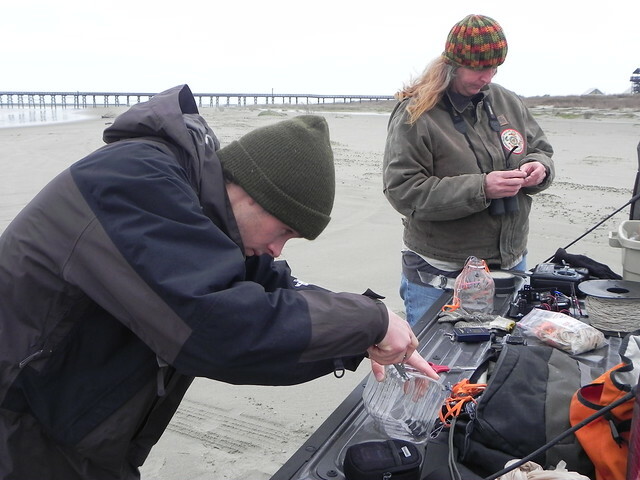 Matt Prendergast, Scott Eustis, and Julia Lightner flew kites on and Grand Isle and Elmer's on 2nd January, 2014. The Initial idea was to map Matt's Grand Isle sites, as well as the evolving sand spit on the east side of Elmer's. These islands are constantly transgressing (moving inland) AND migrating. the spots in question are the "forward" parts of the respective headland and island. Matt Prendergast did work for a Master's thesis on these grand isle sites. Julia Lightner knows everything about Elmer's Island. 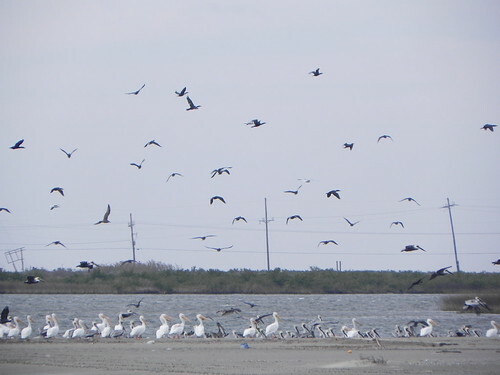 and probably Grand Isle, and seeks to tend to the plant and animal life on the Island for LDWF. 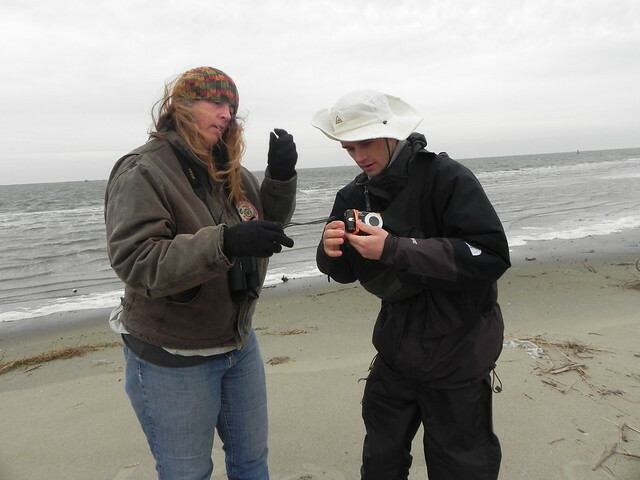 We went to the Grand Isle site first; by the time we arrived at the Elmer's breach, the wind was unmanageable. And a little frightening. Our first flight had some issues. We found that Matt's camera and Julia's camera both failed to trigger with the knot + rubber band. We used a default Canon 1400 mounted to a soda bottle rig. Although there was more than enough wind, we failed to mount the delta kite with a swivel. This caused the kite to spiral out at a horizontal angle, rather than climb. After a crash, we mounted the camera to the RC Picavet rig and only shot from low altitude. 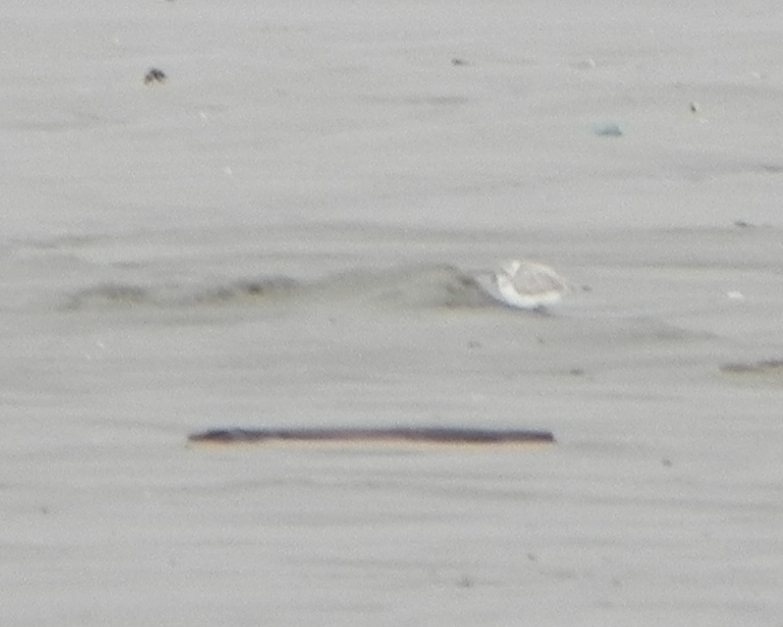 We did manage to capture an image of a new spit rewashed up against the NW-facing shoreline of Grand Isle. This landform is new since Oct 2012 and the last round of Bing photography. The next step is to overlay the new photography with sets from Google (Oct 2012), and Bing (2013) and compare the movement of the sand, and make a simple graphic. There's also a good set of obliques of this area, captured with the RC Picavet. this will be a second Mapknitter. This ever-shifting area of the world remains difficult to document. Julia Lightner, LDWF, and others could benefit from the documentation of restoration efforts that are ongoing in this system. 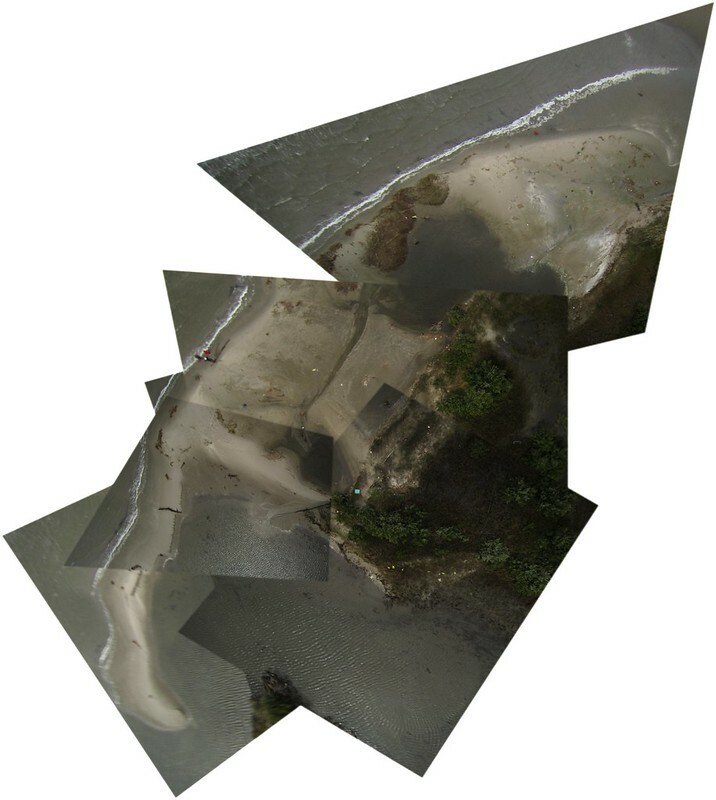 Julia seeks to use kite photography to document the movement of sand, the viability of sand fencing and plantings on the Island-- for the simple reason that storms can alter the island multiple times a year, while aerial photography happens once a year at most, and often at different tidal stages. Survival of existing plantings through multiple coastal storms (29.184988,-90.058218, 29.188425,-90.051532, 29.19191,-90.047809) --how long can we expect plantings to survive? Hillocks vs Linear Sand Fences: what builds a more sustainable dune? This area was oiled well during the BP disaster, but the Elmer's portions of it are part of a larger restoration program. As sand is included in the Caminada Headland restoration, it will be re-washed and "transgress" inland via the washouts, but it will also migrate east and build the evolving spit. Grand Isle is more stabilized, because it is inhabited, but it will also transgress and build to the east. Questions remain about the methods and value of armoring mobile beaches' both these spits have a similar method of armoring. But there is no question that this feature is worth monitoring and restoring, and safeguarding for its ecological values. The birds for whom the island is a refuge from industrial development, or a stopover point for a Gulf migration, the island is home. Human ideas about the ecological value of this slippery place must evolve with the footprint of the island, and cheap aerial photography plays a role in communicating the evolving values of the island to government and the public. Scott encouraged me to put up a research note on this, but considering the fine job he has already done, I offer a few comments: - Scott put together a nice map from challenging conditions - always have everything in order before going out into the field. I did not. - swivel controversy: the question is, can/does a swivel between kite and string reduce spinning or other erratic kite movements? It is my understanding that a swivel facilitates spinning. At a very minimum, what a swivel does is allow something on one side of it to spin freely without affecting what is on the other side of it. Regardless, I still think it is a good idea to put a swivel on the kite line. - one camera perished that day (the kite couldn't resist taking a swim). may the electronics gods guide him to a nice spot in a landfill. - I almost forgot: BIG lesson learned: it is probably never a bad idea to first put your kite or balloon up in the air before attaching the rig + camera. I will try to remember this in the future. - the area mapped, at the northeast end of Grand Isle, is a very dynamic environment and could serve as a site for repeated mapping to show great or rapid change over time. what, the markdown? yeah, it's confusing. it use the br> tag a lot. I don't know what the "Markdown" thing is. Why does it say that? To get a discount in the store? Anyway, the second comment above was in response to how when I wrote the first comment each "-" was on a new line (as in, I hit "Enter") but it didn't show up like that when I Published the comment. I guess I should have previewed it first. No problem. - always have everything in order before going out into the field. I did not. - swivel controversy: the question is, can/does a swivel between kite and string reduce spinning or other erratic kite movements? It is my understanding that a swivel facilitates spinning. At a very minimum, what a swivel does is allow something on one side of it to spin freely without affecting what is on the other side of it. Regardless, I still think it is a good idea to put a swivel on the kite line. - one camera perished that day (the kite couldn't resist taking a swim). may the electronics gods guide him to a nice spot in a landfill. - I almost forgot: BIG lesson learned: it is probably never a bad idea to first put your kite or balloon up in the air before attaching the rig + camera. I will try to remember this in the future. - the area mapped, at the northeast end of Grand Isle, is a very dynamic environment and could serve as a site for repeated mapping to show great or rapid change over time. If you like arbitrary rules, you'll love markdown. I always use swivels because they are so convenient for hooking and unhooking the gear. Another advantage may be that they actually swivel and thereby untwist the kite line that gets twisted when it is wound in hand over hand (one twist per winding). I am not convinced that swivels swivel enough to unwind the windings. My kite line is always twisted. The primary swivel controversy is whether they are safe to use. Some serious kite flyers never use them because they can fail, and use knots instead. I compromise and only use really good swivels, never the kind with the piece of sheet metal, always the wire type. And I use big ones, even though smaller ones are rated high enough. I don't think swivels will have much effect on kite movement.